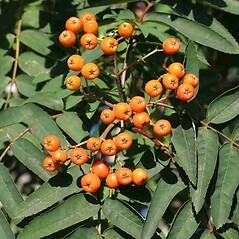 European mountain-ash, also known as rowan, is a European native appreciated for its upright and copious branching, which gives its crown an oval appearance. 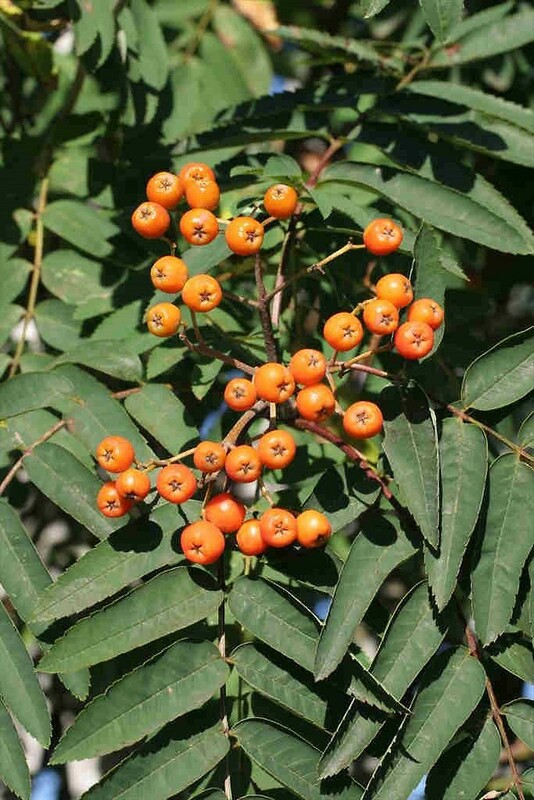 Dense clusters of tiny white flowers mature to orange-red fruits in the fall. 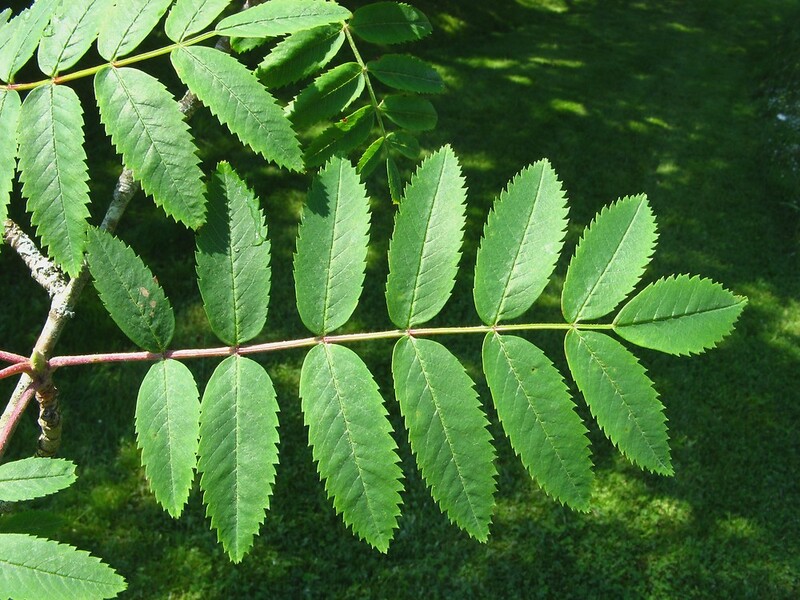 It is distinguished from its American cousin, American mountain-ash (Sorbus americana) by the long, bent (villous) hairs on the twigs, undersides of leaves, and bud scales. Birds relish the orange fruits in the fall. 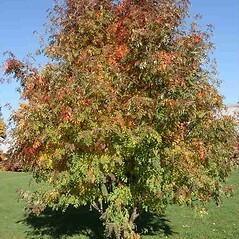 Although this species is planted ornamentally, it is susceptible to diseases and insects and can be quite short-lived if not planted in cool, moist locations. 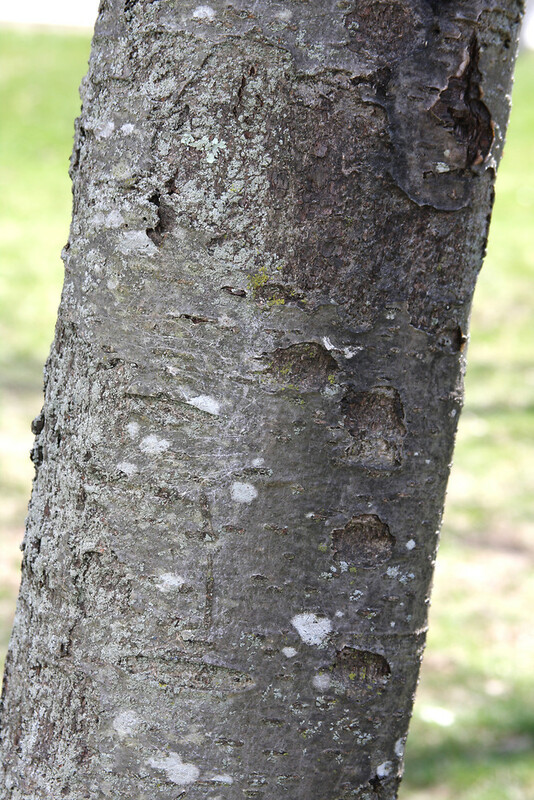 shrubs 1-2 m tall, forming colonies, with dry, dehiscent fruits (vs. S. aucuparia, which are trees up to 10 m tall, not forming colonies, with fleshy fruits). 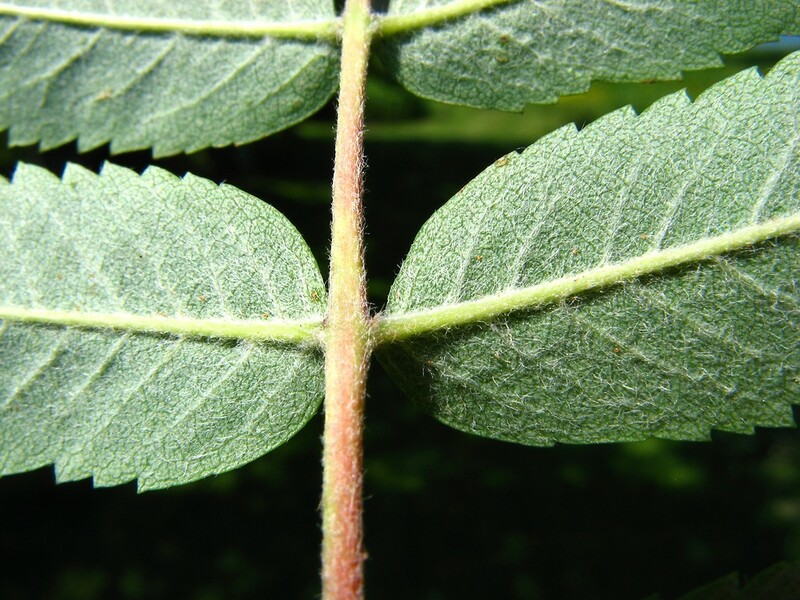 branchlets, inflorescences, winter bud scales, and lower surface of leaflets without hairs or with very sparse hairs (vs. S. aucuparia, with branchlets, inflorescence, winter bud scales, and lower surface of leaflets hairy). 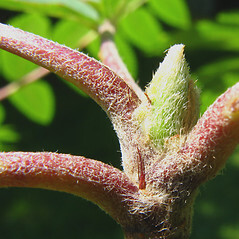 branchlets, inflorescences, and lower surface of leaflets without hairs or with sparse hairs (vs. S. aucuparia, with branchlets, inflorescence, and lower surface of leaflets hairy). 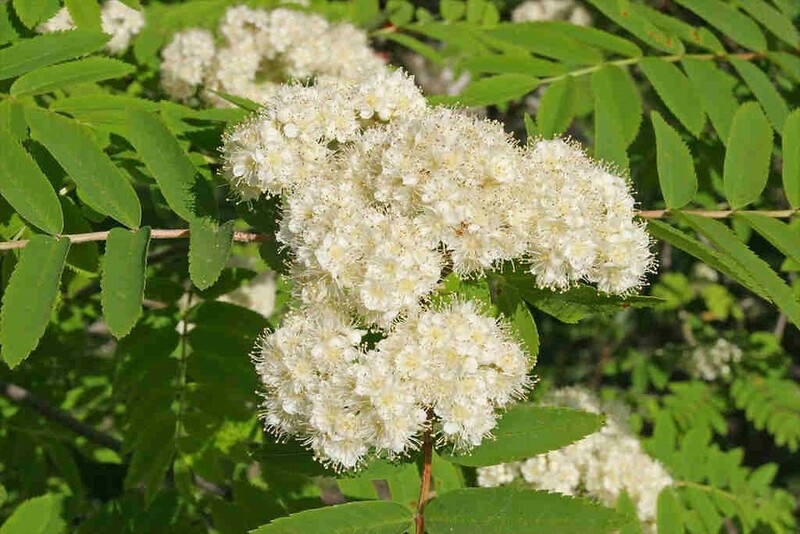 European mountain-ash. 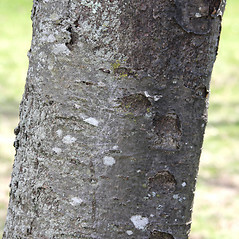 Pyrus aucuparia (L.) Gaertn. • CT, MA, ME, NH, RI, VT. Fields, forest borders and fragments, areas of habitation. 1×S. 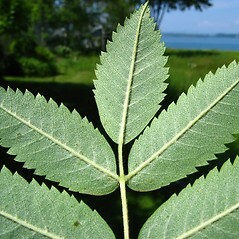 aucuparia. 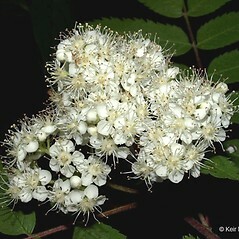 Aronia arbutifolia × Sorbus aucuparia → ×Sorbaronia hybrida (Moench) Schneid. 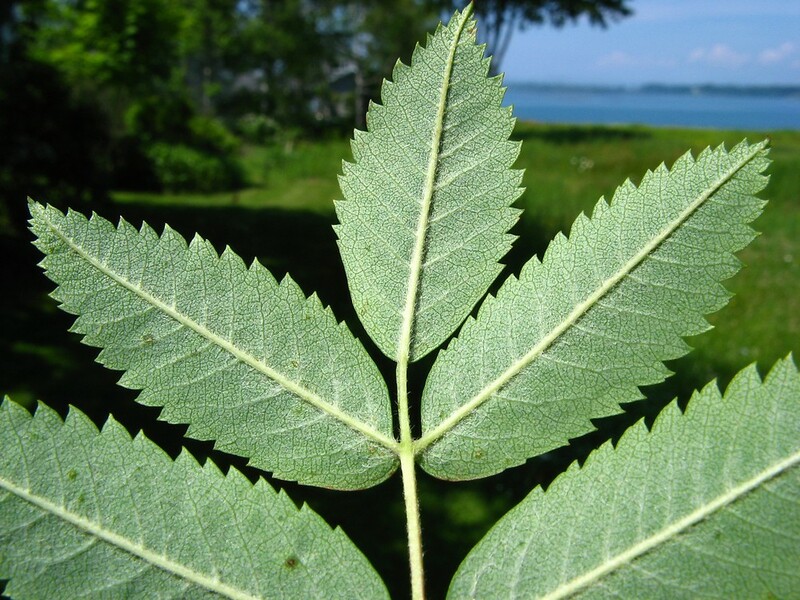 is a rare intergeneric hybrid that sometimes escapes cultivation in New England (it is known from MA). 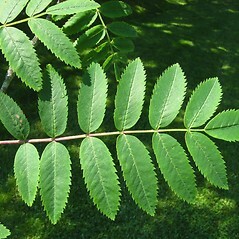 The nothogenus is recognized by its leaves, some or all of which are variably pinnate in which the terminal leaflet is substantially larger than the lateral leaflets (often 2 or more times longer), and the leaf is adaxially provided with dark glands both on the rachis clustered at the origins of the leaflets and along the midvein of the terminal leaflet. 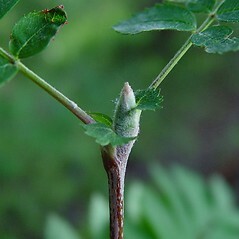 The hybrid is similar in appearance to Sorbus hybrida L., but that species with larger leaf blades (7–12 cm long vs. 3–8 cm long), broader flowering inflorescences (6–10 cm wide vs. 2–5 cm wide), and red fruit (vs. purple to black). 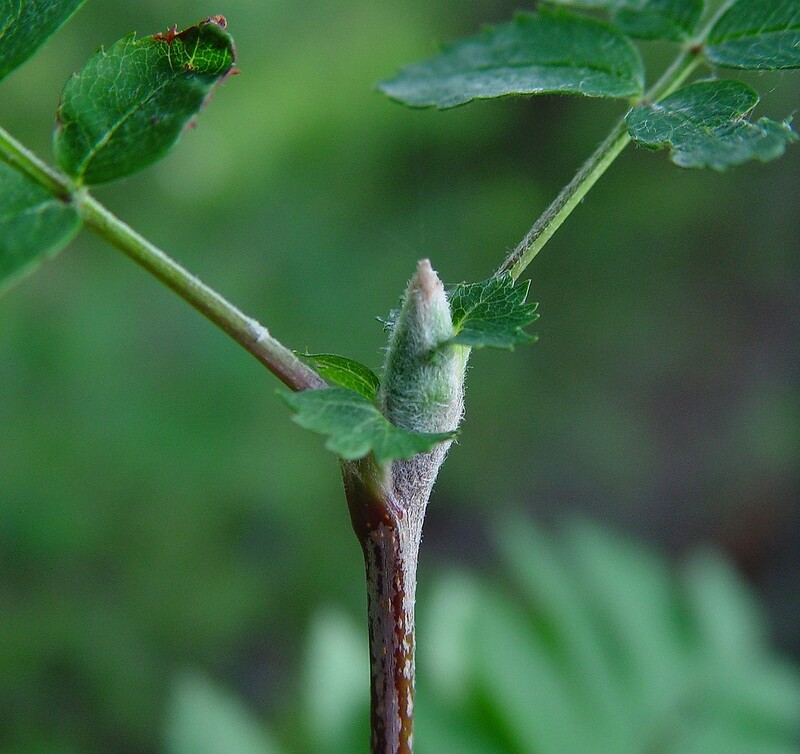 This nothospecies is pubescent in the inflorescence, along new branchlets, and on abaxial leaf surfaces, and it has a dark purple pome. 3×S. 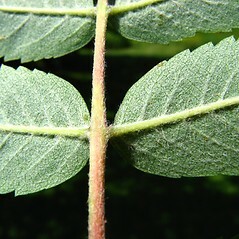 aucuparia. 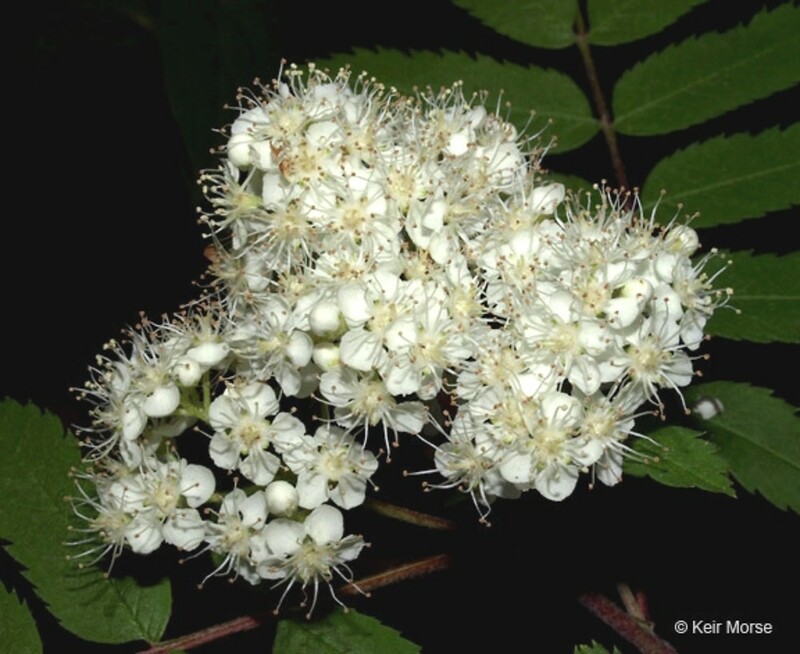 Aronia melanocarpa × Sorbus aucuparia → ×Sorbaronia fallax (Schneid.) Schneid. 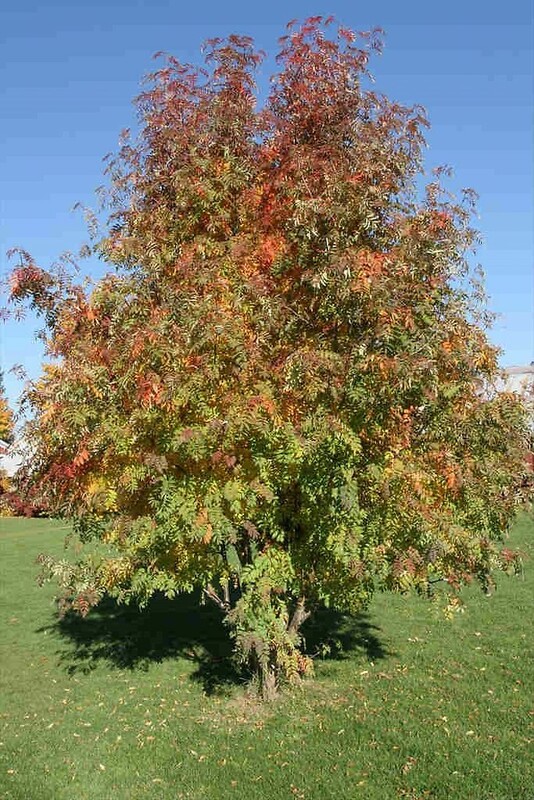 is a rare intergeneric hybrid that sometimes escapes cultivation in New England (it is known from CT, MA, ME). 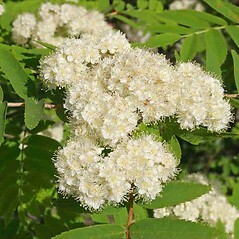 The nothogenus is recognized by characters described under hybrids of Aronia arbutifolia. 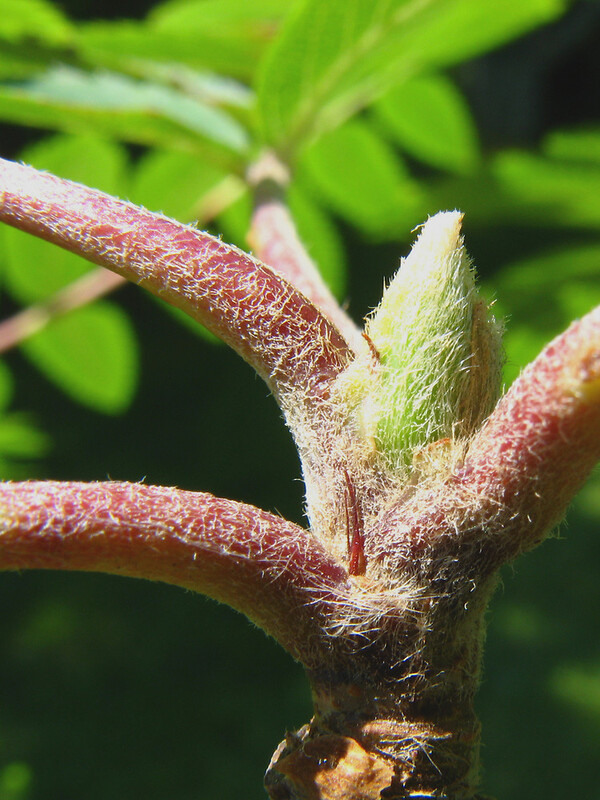 This nothospecies is nearly glabrous in the inflorescence, along new branchlets, and on abaxial leaf surfaces and it has a black pome.